June 9, 2018 23:59 / 2 Comments on Is the U.S. ‘Too Big’ for the Group of Seven? Q: Are the concerns of a superpower relevant to the other G7 members? A: Not really. Maybe it’s time for a superpower group of the U.S., China, the EU, Russia, and The Commonwealth of Nations to form up, instead of the G7 group that has worked very well until now. Even the sage Moses who lived 3400-years ago, suggested, “Thou shall not plow with an ox and a donkey yoked together” and the reason is quite clear to every farmer. Being so dissimilar in size and power, both the ox and the donkey will be miserable the entire time they try to plow forward together and the farmer will spend most of his time ‘arbitrating’ disputes between the two and the plowing enterprise will get little actual plowing done. It’s unfair to the U.S., it’s unfair to the smaller or weaker members of the G7 club and it’s unfair — even to near-superpowers like Japan and Germany which have far different challenges and causes to ‘plow’ than those of the superpowers. Trump’s Criticism of G-7 is ‘Unprecedented’ Scream the Elite – That’s the whole point of Trump! | Steve Hilton, Fox News 2018-06-09. Shall I list the ways? If so, this would become a very long blog post indeed! Which of the G7 partners have a negative balance of trade of $862.8 billion for 2017? The entire G7 combined doesn’t have a negative balance of trade anywhere approaching that of the United States. 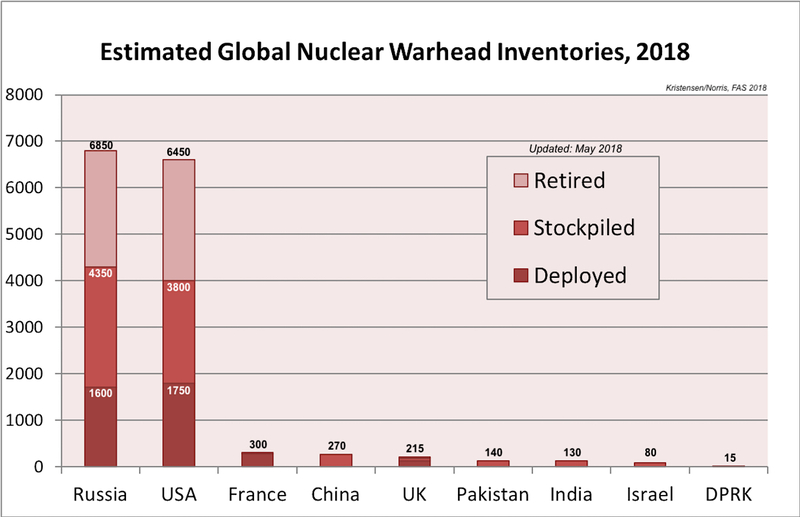 Which of the other G7 members have an inventory of nuclear warheads like the United States which includes 6450 nuclear warheads; 1750 that are retired and awaiting dismantlement, and 3800 that remain part of the U.S. stockpile? 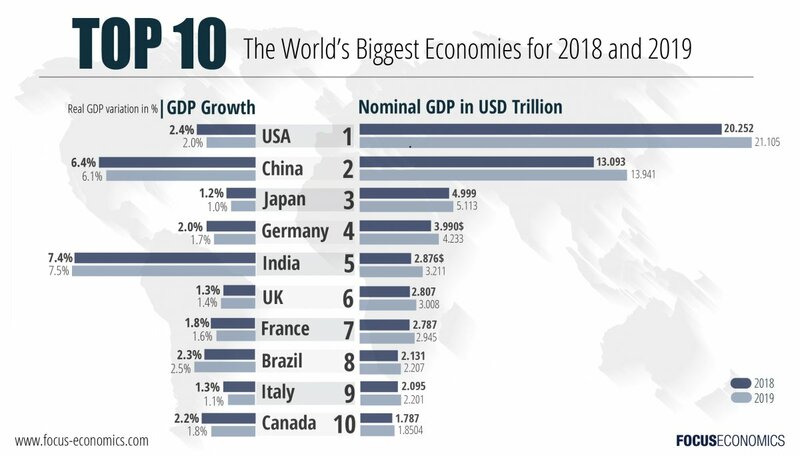 If we’re talking GDP, the U.S. represents 52.8% of the Group of Seven’s GDP, while the next largest country in the group (Japan) represents 13.3% of GDP, with only Germany at 10% remaining as the only other double-digit GDP member of the G7. Population figures and economic growth indicators may be even more telling than the above indicators of superpower status. Should the U.S. Join It’s Own 1-Member Club? That may be a tempting thought for President Donald Trump and certain members of his administration, but there are common concerns among superpowers that only apply to superpowers (and there’s no doubt the U.S. remains the Number One superpower by a significant margin) and it’s those superpowers that must work together to deliver solutions for their large populations. If we look at a superpower club of 5 members: The United States, China, the EU, The Commonwealth of Nations and Russia, we’re looking at a group that is roughly comparable to each other and have similar challenges. Although there are some disparities in nominal GDP among the five countries, we must remember that China is on an exponential growth curve while The Commonwealth of Nations statistic (provided by commonwealth.org) is from 2017 and their economic group is also growing at a rapid rate ($13 trillion by 2020). Russia is the outlier in this group, however, as we shall see, that country has other (huge) chips on the table when it comes to retaining its superpower status. Although nuclear stockpiles vary, the U.S. and Russia were the main protagonists of the Cold War which lasted from 1950 through 1990 which is why they own far more nuclear weapons than all other countries combined. The only EU country to publish their ownership of nuclear weapons is France, with 300 warheads. The Commonwealth of Nations countries that publish ownership of nuclear weapons include the UK, Pakistan and India. While balance of trade issues vary wildly between the United States, China, the EU, The Commonwealth of Nations and Russia, very few countries can play in the triple-digit or even high double-digit space occupied by those nations. Especially when analyzed using their (Nominal) and (Purchasing Power Parity) GDP numbers, these are exceptional nations and groupings of nations, which put them in a different category than other countries. There is nothing wrong with small countries and there is nothing wrong with big countries. But small countries have far different challenges than large countries, and everything happens on a truly massive scale for the bigger countries and in country groupings like the EU and The Commonwealth of Nations. And those differences cause irritations. Instead of heads of government trying to plow forward with their challenges and issues while ‘yoked’ to dissimilar and dissimilar-sized partners, why not make it easier on everyone and ‘put like with like’ to gain a more comfortable fit? It’s so obvious this should be done and the latest G7 meeting proves that the problems in that organization are systemic problems and are the sole cause of divisions between the oddly mismatched countries of that group. Every country stuck in a trade or political grouping that doesn’t match it’s particular talents will suffer. Therefore, the Big 5 must form into a group of their own, and the G20 (minus the by-then departed ‘Big 5’ members) must attract ‘the Next 20 nations’ to their refashioned N20 organization. In that way, the top 25 countries in the world can finally become all that they can and should be instead of being held back by arbitrary, mismatched, or outdated groupings. And, isn’t that what it’s really all about? China is growing and modernizing rapidly, of that there’s no doubt. With an economy second only to the United States, and home to 1.35 billion citizens, it’s the country that created the largest manufacturing sector in recorded history. Therefore, it makes sense that China is attempting to shore-up it’s marine security in the South China Sea through which $5 trillion worth of goods pass annually. It has been noted by sailors for hundreds of years that complex navigational hazards await those ships that navigate through the busy South China Sea. The waterway is full of sandbars, shoals, partially submerged islets, and some islets are only visible at low tide, while others lurk only a few feet beneath the surface of the sea — safe enough for 5-person sailboats to pass over, but exceedingly dangerous for container ships to traverse. Running aground and getting stuck half-out of the water on top of the shoal or sandbar is incredibly dangerous. Once a distress call goes out, pirate ships operating in the region are ‘magnetically attracted’ to those grounded ships. If you think that piracy-at-sea is a big problem with a ship capable of running at full speed and able to quickly change course, you’ll understand what happens to a ship and crew that is stuck on a sandbar for a few days. You don’t want to be that crew, ever. Just one more reason to have a strong anti-piracy component operating in the South China Sea. South China Sea nations. Image courtesy of AFP. Where such islets are located in North American waters, they were long ago deemed navigational hazards and were either destroyed via explosive charges or had lighthouses with foghorns installed on them to constantly warn ships of their location. A few have a runway installed so that patrol aircraft can refuel. Which is exactly what China has been working on in recent months. Surprising to nobody is that some of China’s neighbours are concerned that the huge and powerful nation not all that far from them could become even more powerful than now, and it could decide to be not as nice to deal with as it has been in recent years. Which gives more reason for all South China Sea nations to work together to craft a common strategy for China’s security and their own security. Building upon the uber-successful NATO model, an organization of Atlantic Ocean member nations and having conducted millions of operations in the Atlantic ocean since it’s creation on April 4, 1949, is the most logical way for China to gain the additional security it needs — while proving to regional neighbours that it poses no threat to them and is merely working towards a clearly demarcated, safe shipping zone for the South China Sea. Even the leaders of the world’s most powerful nation the United States of America, know that nothing of lasting significance can be achieved by one country acting alone. Therefore and in that context, I respectfully urge President Xi Jinping of China to work with all of the nations of the South China Sea in a spirit of mutual trust and goodwill in an effort to jointly address the opportunities of regional maritime security. In this way, by taking the lead in the creation of a mutually beneficial organization, not only will maritime security in the region improve, but other upgrades to diplomatic relations around the world will surely follow.